No matter how experienced your group leader, they can never make up for the knowledge gained from a lifetime in the destination. That’s why many of our trips work with local guides around the world – who invite you into their homeland with pleasure. As well as doing crazy things like climbing Kilimanjaro 100 times, they also donate their time to local projects supported by travelers – such as rebuilding Sri Lankan villages following the 2004 tsunami. Inti Runakunaq Wasin (IRW) is Quechua for “House of the People of the Sun”. It is a non-profit organization based in Cuzco that acts as a haven for children and adolescents who live in extreme poverty. The home is open during the day and is run by a staff of volunteer teachers and social workers. Children are given the opportunity to voluntarily drop-in to receive help with homework, a warm meal and participate in a variety of classes and workshops that teach them valuable skills including jewelry making, leather working, cooking, music and English. IRW currently rents a small house and supports 50 children through their programs. However, there are still many more children working and living on the streets of Cuzco. The goal of Planeterra together with IRW is to purchase a piece of land and build a bigger home in order provide support to more children and families. In January and March 2005, we developed and offered training courses to 123 people from four local communities just outside of Cuzco to work as Porters and Cooks on the Inca Trail. The women and wives of our cooks and porters from the Ccaccaccollo Community saw how we were working to provide jobs on the Inca Trail and approached us to ask us for support to develop a women's weaving project. Three women from the Ccaccaccollo Community took part in a three month training course held by a local organization in which they learned ancient weaving techniques of the Incas including how to dye the wool using native flowers and plants. Each of the three women continued on to teach the rest of the women what they had learned and today 60 women have joined together to create the Ccaccaccollo Women's Weaving Project. Beginning in April 2005, we began to visit this community as part of the Sacred Valley Tour where they have the opportunity to meet the women and learn about all the stages of the weaving process; from spinning the sheep wool, to dying the wool using natural dyes, and participating in a weaving demonstration. Travelers are also given the opportunity to purchase high quality textiles directly from the women who made them. By working directly with the Ccaccaccollo community we and the Planeterra Foundation are encouraging men and women to be proud of their cultural heritage, and enabling them to benefit from tourism in a way that avoids negative social and cultural impacts while providing economic benefits. 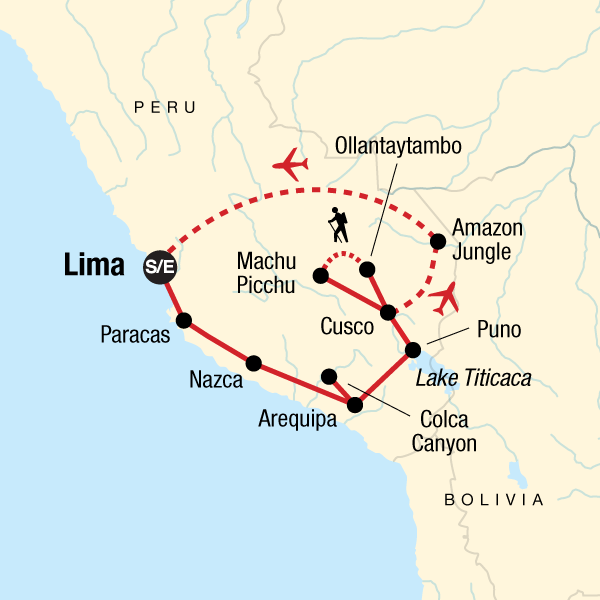 The Inca trail with it's altitude challenge, great food, vistas and memorable porter feats stand out. The Absolute Peru package is about being outside; outside everyday comforts and the usual city sightseeing. So be open to a vacation full of memorable experiences. Everywhere we went I was very conscious of the fact that we are directly supporting the local communities by eating in local markets, staying in local b&bs and generally transacting with locals. It was a great experience and I was surprised by the diversity offered by Peru; the cities being very different from the smaller towns and the towns being vastly different from the solitude of the Inka trail and the Amazon. Arriving to the Sun Gate at 6am after the Inca trail...and seeing the clouds moving away and revealing Machu Picchu! The homestay in the peninsula of Lake Titicaca was also the most amazing experience as was the bus ride from Puno to La Paz... those views of the Lake Titicaca were so beautiful, both on Peruvian and Bolivian side! Also riding the Worlds most dangerous road in Bolivia was super!!! Remember that Peru and Bolivia are developing countries and hygiene and timekeeping are rather different there. Remember respect locals and their way of life too! Also, very importantly, take the Trip dossier with a pinch of salt as the company should update the trip dossier as the tour is not exactly what it says in the package, however, some things were much better than expected, some were disappointing. I felt it did! This company is one of the best companies and does a lot for the local people i.e. in the Inca trail their porters are treated very well and paid more than others, hence, everyone wants to work for them and also they had moved the homestay from the Taquile island to the peninsula to benefit local people there too!! Absolutely amazing!!! I would definitely recommend and would do it again if I could!